There’s a big difference between knowing and doing, isn’t there? It’s baffling, the gap between what I know and what I do. I called this TinyLetter “Like I always say…” because it’s infinitely easier to rattle off wise words for happy living (like “This, too, shall pass”) than to follow them. Especially in moments of stress. I actually know quite a bit about best practices for a happy, productive life, having immersed myself in personal development (a much better term than “self-help”) content since high school. I can explain researcher John Gottman’s Four Horsemen of the Apocalypse, the four types of interaction that predict divorce and other ruptured relationships, but I still react with defensiveness, contempt, and stonewalling when I’m really angry. 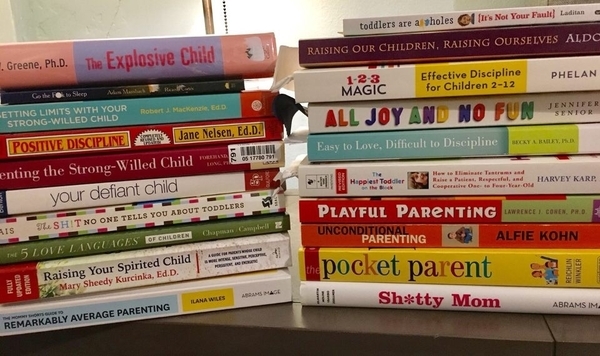 I can share nuggets of wisdom from my sheroes Oprah, Elizabeth Gilbert, Brene Brown, and Gretchen Rubin, and I have 20+ parenting books on my shelf (see photo — Evan’s spirited nature has really given me a run for my money!). So why am I not a fully expressed human being and exceptional parent by now? Why do I keep tripping over what Gretchen calls “happiness stumbling blocks”? 1) Analysis paralysis. Over 20+ years, I’ve amassed an enormous toolbox to draw from. Under duress, I find myself desperately rummaging through the jumble of tools and coming up empty because there are just so many to choose from. What I can do: Organize my toolbox in advance. When I learn about a new tool, I can decide what to use it for: “This will be a good tool for (when Evan sasses me / I find myself procrastinating / I feel hopeless.”) That way, when the situation calls for a wrench, I’m not trying to fix it with a hammer I grabbed from the mess at random. 2) Unrealistic expectations. I expect myself to apply best practices as soon as I encounter them, but things are simply easier said than done. That’s why New Year’s resolutions fall by the wayside, even though we know they would make us happier and healthier. It’s just human nature to fall into the same old habits we’re used to. What I can do: Realize that these lessons are called “practices” for a reason, because they’re not quick and permanent fixes, Like the board game Othello, they take “a minute to learn, a lifetime to master.” I’m working on taking a pause before reacting, and while this will get easier, it may always take conscious effort — especially when it comes to parenting. 3) Blind spots. It’s hard to notice the gradual evolution in yourself because you’re with yourself 24/7. It’s like how you see someone else’s kids every so often and see how much they’ve grown, but you don’t notice the same kinds of changes in your own kids. ​What I can do: Recognize progress. I wish my 15-year-old self and my 37-year-old self could have coffee together so I could see all the ways I’ve evolved, due to life experience and work on myself. I know that I’m kinder, more confident, and less judgmental, and even in the areas I’m still working on, I’ve made progress. What are the gaps between what you know and what you do? Where have you made progress, and which tools are you using to keep doing better? Hit reply and tell me. Last week I was drafting a different TinyLetter that just wasn’t working, and I felt deflated and frustrated after wasting the one precious hour I have for creative projects in the morning. 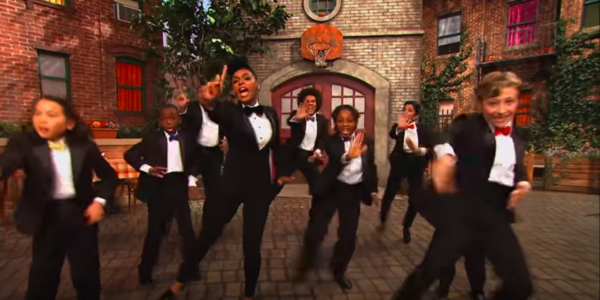 My sister happened to send me a clip of Janelle Monae on Sesame Street singing “The Power of Yet” (It “needs to be my mantra,” she said). It brought tears to my eyes because it was — and continues to be — exactly what I needed to hear. Selling our old house (hallelujah!) has freed up time and money to put into our new house, and I was overjoyed to buy a longtime wish list item: a digital piano. I grew up playing an upright piano but have grown to prefer a digital because it’s compact and easy to move, you can change the key (helpful for singing when the piece is written too high or low for your voice), you don’t need to tune it, and there are a lot of fun features built in, like different instruments, a metronome, and the ability to record. I’ve been learning the Westworld theme, which is a shiveringly gorgeous piece of music, through a Guitar Hero-style tutorial on YouTube. The kids are enjoying messing around with making music, too. I’ve been loving Spotify’s Time Capsule, which creates a two-hour playlist of songs from your teenage years based on your age and location. From “Interstate Love Song” to “I Love Your Smile,” these songs are making me feel like I’m 15 again, in the best way possible.